Every year, we carefully select some exciting “new” vegetable varieties to offer as part of our organic spring seedling pre-order program. This year, we are introducing 12 new varieties (photos below)! Of course, they aren’t really “new” – just new to our plant list. In fact, they all have quite a story behind them. There are so many seeds to choose from! We do our homework – scouring seed catalog descriptions, and conducting field trials of many open-pollinated and heirloom varieties on the farm each year. Many of the seedlings we offer for sale are the same ones we choose to grow on the farm year after year. All of the seed varieties we grow for our plant sale and pre-orders have been carefully selected by the Stout Oak farmers for their excellent flavor, reliability, productivity, disease resistance, and ability to thrive in our New England climate. Kaleidoscope pattern of red and yellow stripes over green skin. The flesh is truly tri-color too, infused with various shades of red and yellow. Each of these colors has a different flavor resulting in a spicy, sweet, tart tomato with good acid all in one fruit. Medium to large fruit. Tall plants will need staking. Medium to large fruit. Tall plants will need staking. Open pollinated variety. 75 days to maturity. This is one we’ve grown at Stout Oak for many years. We put Cosmo back on the list this year because it’s way better than a few of the other red varieties we’ve tried. 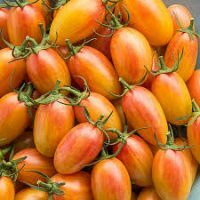 This is a Ukrainian heirloom variety with rich, complex flavor. The fruit are very juicy, and medium to large in size. This also happens to be a favorite of our Ukrainian friend Oksana from Bucovina Cuisines in Kingston, NH. Semi-determinate plants are bushy and vigorous. Some staking is needed but plants will stay 3 – 5 feet tall (shorter than fully indeterminate varieties). A Stout Oak Farm Tomato Tasting Winner! 72 days to maturity. Gorgeous blue/purple fruit with a blush of red. Starts producing early and keeps going into well into the fall. Disease resistant plants are indeterminate (need staking). Small fruit (2 to 4 oz each). Fruit grow in clusters. 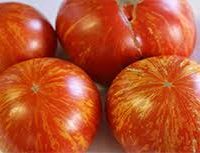 High in Lycopene and Vitamin C. Open pollinated variety. 75 days to maturity. 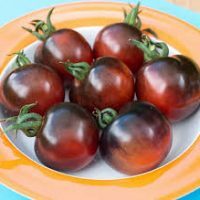 Strikingly gorgeous bright red and yellow striped tomato with complex, rich flavor. 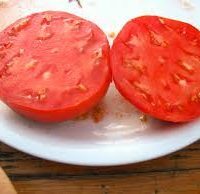 Medium-sized beefsteak type tomato. Disease resistant and also resistant to cracking. Indeterminate type, so it will need staking. Reliable producer. Open-pollinated. 75 days to maturity. 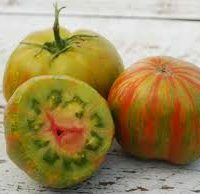 Heirloom and open-pollinated seeds, grown organically. The vast majority of the seeds we choose to grow at Stout Oak Farm are open-pollinated and heirloom varieties. 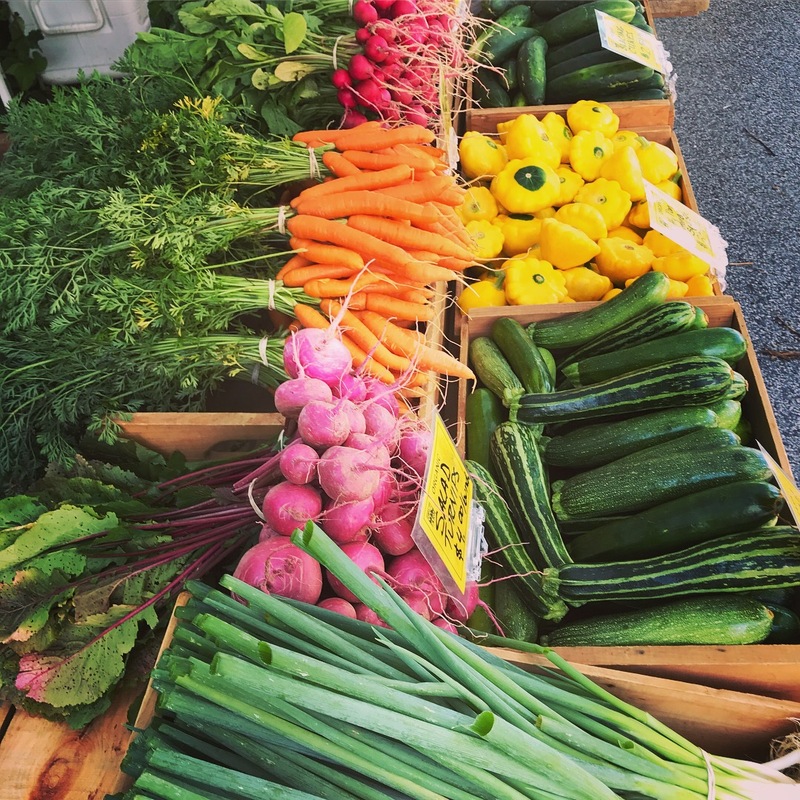 All of our seed is purchased from New England-based seed companies that share our values (pro-organic, pro-small-scale, family-owned local agriculture, and anti-GMO). We hope you’ll let us grow your seedlings for you this year! All of our plants are Certified Organic and grown here at our farm. This one is a smaller tomato in the “cherry/saladette” category. 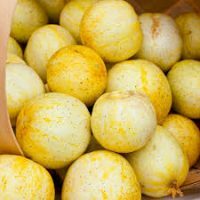 Gorgeous yellow oval-shaped fruits with a pink “blush” when ripe. Excellent, very sweet flavor. Plants are vigorous and require staking. This is a favorite of our Greenhouse Manager Bridget Gould, who made sure it got added to the list this year. Open pollinated. 60 days to maturity. 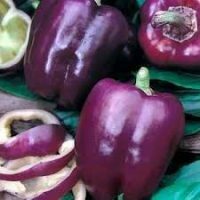 A truly beautiful, purple bell-type pepper. The four inch by three inch, blocky fruits have thick, sweet, flavorful flesh. The plants are highly productive and will grow to 30 – 36″ tall. Add color and flavor to salads! Hybrid variety. 70 days to maturity. 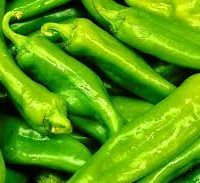 Mild green chile pepper. Add a little spice to your stir-fries, or use them for chiles rellenos. We freeze and can plenty of this for cooking with all winter long. Fruits are 7″ long fruit, and taper to a point. Turn from green to red. Not too hot! Open pollinated variety. Peppers will eventually turn red, but that doesn’t happen reliably in our climate. Harvest green before the first frost. Open pollinated variety. 78 days to maturity. Perfectly round lemon-yellow cucumbers are the sweetest, juiciest cucumbers we’ve ever grown! About the size of a tennis ball. Perfect for snacking on in the garden. So fun to grow! Kids love to grow and eat these. Heirloom variety. 65 days to maturity. This winter squash has yellow flesh that pulls apart into “noodles” when cooked. Popular as a substitute for pasta. Harvest in the fall once the vines have died back. Store and wait to eat until skin is deep yellow and fruit is fully mature. Sprawling vines take up some space in the garden. Plant 3 feet apart. Open pollinated variety. 88 days to maturity. A tried-and-true New England bean. No staking needed due to their bush habit. These beans are crisp and delicious! 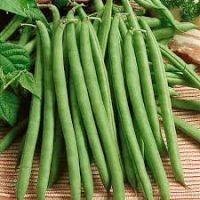 Heavy producer of 5 to 6″ long beans for fresh eating or canning. Harvest every few days once the pods begin to size up. Open pollinated variety. 50 days to maturity. Excellent producer of tasty 7 to 9″ stringless beans. Pole beans will need a fence or trellis to climb on. 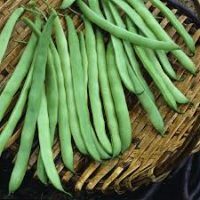 Pole beans are very productive, and make for easy picking! Excellent for fresh eating, and also make a great soup bean. Harvest every few days to prevent beans from getting too big. Heirloom variety. 65 days to maturity. Okay, this is not a vegetable, but it is a lovely plant to include in your garden. Bees love these flowers! 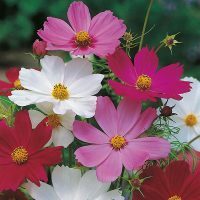 Kate learned to grow Cosmos as pollinator-attractors when she was farming in California, and has loved them ever since. Annual plants grow to be at least 48″ tall, and bloom all season long. Sing flowers are 3-4″ across in lavender, pink, magenta, and white. Tall stems with fine wispy foliage. Open pollinated variety. 75 days to maturity. and place your order soon to reserve your favorite varieties!